This entry was posted in BLW on September 6, 2017 by Bright Line Watch. From May 11–20, 2017, Bright Line Watch conducted its second expert survey of political sci­en­tists assessing the state of democracy in the United States. BLW’s first survey (Wave 1) was conducted at the outset of the Trump admin­is­tra­tion in February 2017. This report presents results from the second survey (Wave 2), which was completed soon after the first 100 days of the Trump pres­i­den­cy. It evaluates how experts view the United States in com­par­i­son to Wave 1 and to prior periods in U.S. history. In this wave, we invited 9,539 political science faculty at 511 U.S. insti­tu­tions to par­tic­i­pate. By Saturday morning, May 20, we received 1,126 qualified responses (a response rate of 12 percent). This report is based on those data, which are available here. The Wave 2 survey had two goals. The first was to assess how our respon­dents rate the current state of democracy in the United States. To do that, we asked them to evaluate the United States using a battery of twenty-nine state­ments of demo­c­ra­t­ic prin­ci­ples. The second purpose was to evaluate the per­for­mance of American democracy in his­tor­i­cal context, which we accom­plish by (a) comparing responses between our Wave 1 and Wave 2 surveys and (b) asking respon­dents in Wave 2 to rate the overall quality of U.S. democracy at different times from 1800 to the present. Respondents were then asked to evaluate the overall per­for­mance of U.S. democracy today on a 0–100 scale. After providing a rating, they were then asked to provide a similar rating at nine his­tor­i­cal points: 1800, 1850, 1900, 1950, 1975, 1985, 1995, 2005, and 2015. How is U.S. democracy doing? 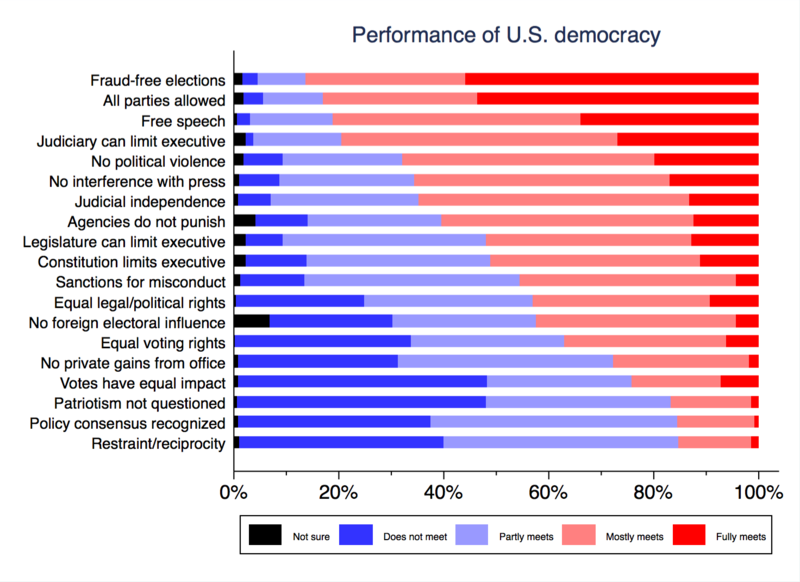 According to our experts, the per­for­mance of U.S. democracy varies widely across different types of demo­c­ra­t­ic prin­ci­ples. Rights of expres­sion are perceived as well-protected, but ratings of elections and political account­abil­i­ty are mixed and standards of political equality and civility are over­whelm­ing­ly rated as not being met. As the figure illus­trates, there is a sharp break in per­for­mance assess­ments between state­ments for which over half of our respon­dents rated the United States as “mostly” or “fully” meeting the standard and state­ments for which over half said the United States “does not meet” or only “partly meets” the standard. We use this fifty percent cutoff to dis­tin­guish strong from weak performance. To facil­i­tate overall assess­ment of the results for our extensive list of demo­c­ra­t­ic prin­ci­ples, we sort the survey state­ments into groups reflect­ing broader themes and present the average per­cent­age of respon­dents who think the U.S. mostly or fully meets the standard in question for each. As these values indicate, respon­dents generally view the U.S. as per­form­ing well on demo­c­ra­t­ic prin­ci­ples related to freedom of expres­sion. However, views are more mixed on prin­ci­ples related to political and legal account­abil­i­ty. The judiciary’s inde­pen­dence (58%) and check on executive power (76%) are rated highly, but other checks on mis­con­duct and the exercise of executive power receive lower ratings (29%-45%). Similarly, most experts believe U.S. elections are conducted without fraud (83%) or inter­fer­ence in the parties who can par­tic­i­pate (82%), but ratings of other aspects of elections related to foreign influence (35%), campaign funding (34%), par­tic­i­pa­tion (10%), and bound­aries of electoral districts (7%) are much lower. Finally, ratings are con­sis­tent­ly dismal for measures of political, legal, and electoral equality (average: 28%) and respect for norms of political civility and consensus about the validity of infor­ma­tion on politics and policy (average: 14%). What changes do we see over time? 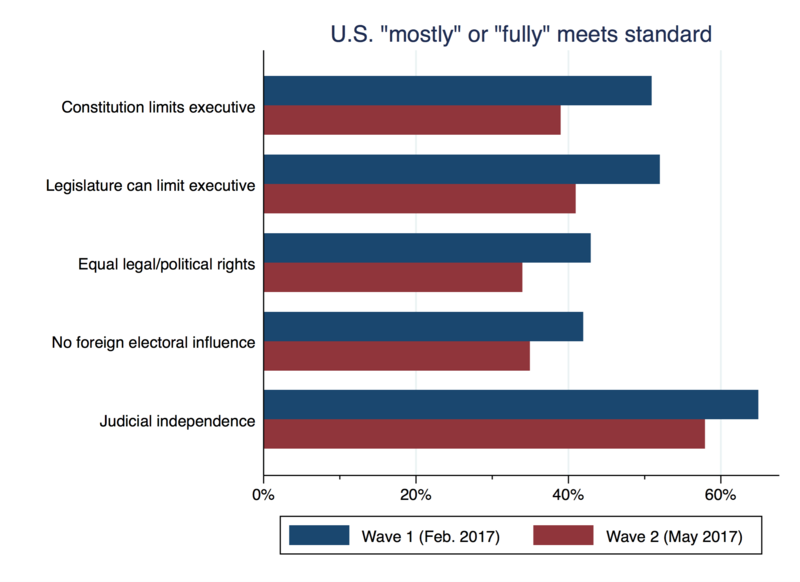 Our Wave 2 survey provides per­spec­tive on changes over time in expert assess­ments of democracy at three levels of gran­u­lar­i­ty — changes while our survey was being admin­is­tered, changes from Wave 1 to Wave 2, and changes across broader eras of U.S. history. Our initial intention was to focus on the latter two com­par­isons, but the dramatic events of the week of May 15–20, 2017 also allow us to evaluate how responses changed while our survey was in the field. In the six days after we first issued survey invi­ta­tions on Thursday, May 11, the political news cycle was dominated by President Trump’s firing of FBI director James Comey on May 9 and sub­se­quent rev­e­la­tions about the moti­va­tions for Comey’s dismissal. However, the news cycle took a dramatic turn on the evening of Wednesday, May 17, when Justice Department announced that Robert Mueller had been appointed as a special counsel to inves­ti­gate Russian inter­fer­ence into the 2016 election and whether it included collusion with Trump campaign officials. He was also given authority to consider any potential efforts to obstruct the investigation. “Executive authority cannot be expanded beyond constitutional limits” increased from 35% to 48%. “Law enforcement investigations of public officials or their associates are free from political influence or interference” increased from 32% to 45%. These shifts suggest that our respon­dents were reassured by Mueller’s appointment. We also evaluate shifts in our expert respon­dents’ assess­ments between our Wave 1 survey, which was conducted in February 2017, and our Wave 2 survey. To do so, we compare responses on the nineteen state­ments that were asked in both waves. This dete­ri­o­ra­tion was likely driven by events in the news. From the first to the second waves of our surveys, the Russian influence scandal attracted increas­ing attention, which may have con­tributed to declining expert ratings of con­sti­tu­tion­al limits on, and leg­isla­tive control over, the executive, as well as foreign electoral influence. (Our analysis above suggests the Mueller appoint­ment mitigated the perceived dete­ri­o­ra­tion of con­sti­tu­tion­al limits on the executive.) Finally, the observed dete­ri­o­ra­tion in per­cep­tions of judicial inde­pen­dence and equal legal/political rights may reflect the dis­si­pa­tion of attention to actions by courts blocking the Trump administration’s executive order banning travel from majority-Muslim countries, which was intense at the time of Wave 1. The second main battery of questions on the Wave 2 survey asked respon­dents to rate the overall quality of U.S. democracy on a 0–100 scale in 1800, 1850, 1900, 1950, 1975, 1985, 1995, 2005, 2015, and 2017. The years we selected cor­re­spond­ed to distinct eras in American history. For instance, the first four cover the time period shortly after the founding (1800), the middle of the 19th century but before the Civil War (1850), the era of pro­gres­sive reforms but also Jim Crow in the South (1900), and the mid-20th century period after the New Deal but before the main gains of civil rights movement (1950). As we moved toward the present day, we expected our respon­dents’ knowledge of U.S. democracy and ability to discern dif­fer­ences in quality would grow. Accordingly, we asked for assess­ments across narrower time gaps (1975, 1985, 1995, and 2005). Finally, we asked for assess­ments in 2015 and 2017 to measure any perceived shift in demo­c­ra­t­ic quality under the Trump administration. 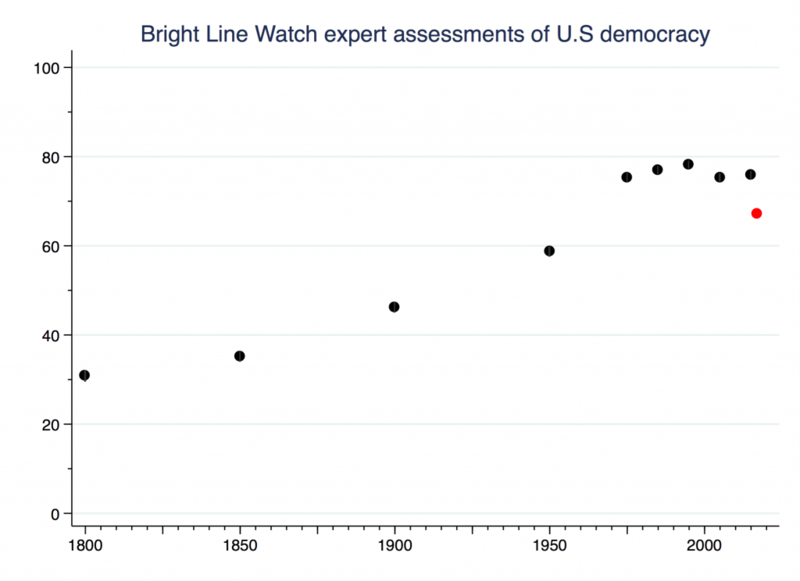 We observe steady and dramatic increases in the assess­ments of the quality of U.S. democracy from the founding era up to the late 20th century. The increase from 1800–1850 coincides with expansion of suffrage beyond property holders to most of the white male pop­u­la­tion. The period from 1850–1900 saw the Civil War, the abolition of slavery, the Civil Service Act, and the beginning of the Progressive Era reforms, but also the aban­don­ment of Reconstruction and the estab­lish­ment of Jim Crow in the South (1850–1900). The period from 1900–1950 saw the rat­i­fi­ca­tion of the 19th Amendment to the Constitution guar­an­tee­ing women’s voting rights as well as the vast expansion of the federal welfare state under Roosevelt’s New Deal and the first achieve­ments of the civil rights movement. Our respon­dents rated U.S. democracy as improving steadily during this period, sur­pass­ing a mean score of 50 on the 100-point scale for the first time. The time lapses in our survey question shortened at this point. Between 1950 to 1975, the country expe­ri­enced the high water mark of the civil rights movement, including landmark civil rights leg­is­la­tion in 1957 and 1964 and the Voting Rights Act of 1965. The average rating for US democracy rose more steeply during this 25-year span than it did on average during the prior 50-year intervals. Subsequently, the assess­ments from our experts plateau over the next four decades, remaining roughly stable over ten-year intervals from 1975–2015. During this period, there is no clear dif­fer­ence in overall eval­u­a­tions of U.S. democracy across admin­is­tra­tions with dia­met­ri­cal­ly different governing ide­olo­gies, including the two-term pres­i­den­cies of Ronald Reagan, Bill Clinton, George W. Bush, and Barack Obama. In 2017, however, we observe a decline in the final rating after the beginning of the Trump administration. The Trump slump is worth examining more closely. As sum­ma­rized in the chart below, fully three-quarters of the experts surveyed reg­is­tered a decline in the quality of U.S. democracy between 2015 and 2017. About a quarter regarded this as minor (between 1 and 5 points on the 100-point scale), another quarter gauged it as moderate (6 to 10 points), and 27% estimated it as larger than 10 points. By contrast, 21% perceived no change across the most recent two years and only 4% rate U.S. democracy as stronger in 2017 than in 2015. Clearly, our expert sample of political sci­en­tists views the quality of US democracy more neg­a­tive­ly in May 2017 than it did in the past. Findings from the Wave 2 Bright Line Watch survey indicate that con­fi­dence in parts of the basic framework of liberal democracy in the U.S. remain solid, but sig­nif­i­cant concerns exist and are growing in numerous areas. Respondent assess­ments of the U.S. vary widely across different dimen­sions of democracy. Evaluations of the rights that guarantee freedom of expres­sion, including of unpopular ideas, are con­sis­tent­ly positive. However, assess­ments of the quality of elections and mech­a­nisms of account­abil­i­ty are mixed; some specific prin­ci­ples are widely regarded as met whereas others are seen as deficient. For example, there is wide­spread con­fi­dence that the minimum con­di­tions for demo­c­ra­t­ic elections, such as the absence of fraud, are fulfilled but other elements of electoral quality, including unbiased electoral districts, high par­tic­i­pa­tion rates, and trans­par­ent dis­clo­sure of campaign funding, are held to be lacking. The variation in in our respon­dents’ judgments of mech­a­nisms of account­abil­i­ty is not quite so wide but still remains uneven. The U.S. judiciary is held in high regard for its inde­pen­dence and its ability to exercise a check on executive authority, but other checks on gov­ern­ment power and forms of account­abil­i­ty command far less esteem. Most respon­dents are skeptical about the effec­tive­ness of Congress as a check on the executive, whether public officials can be con­strained from abusing their authority, and whether inves­ti­ga­tion and enforce­ment mech­a­nisms are uncom­pro­mised by political considerations. Finally, our respon­dents rate the United States as deficient on metrics of political equality, including voting, legal, and political rights, as well as on equality of influence both at the ballot box and in shaping public policy. Assessments of respect for the behav­ioral norms that sustain civil discourse, including decency toward political opponents, will­ing­ness to com­pro­mise, and even to seek common under­stand­ings on basic facts, are lower still. Over time, our expert respon­dents perceive the quality of U.S. democracy as increas­ing steadily for the first two centuries after inde­pen­dence, with the most dramatic gains con­cen­trat­ed in the decades imme­di­ate­ly following World War II. Those gains were preserved through the Cold War era and into the 21st century despite the turmoil following the 9/11 attacks and the war on terror. Between 2015 and the present, however, our respon­dents perceive a sharp decline in the quality of democracy, the first for any time interval we examined. We will continue to explore the sources and per­sis­tence of this shift in future surveys, but the evidence from February to May points toward inten­si­fy­ing concerns about whether con­sti­tu­tion­al limits on executive authority can be enforced, whether Congress is willing or able to enforce those limits, and whether legal and political rights will be equally guar­an­teed to all Americans. We are not shocked by our results given the ongoing political battles over these core demo­c­ra­t­ic prin­ci­ples, but their famil­iar­i­ty in no way limits their urgency. We will continue to monitor the quality of democracy in the United States in future reports. Bright Line Watch conducted its first expert survey on U.S. democracy in February 2017 (Wave 1). We received comments and feedback on the instru­ment from dozens of political science faculty who took the survey as well as from jour­nal­ists and other scholars who took an interest in the project. We incor­po­rat­ed many of those sug­ges­tions in designing the Wave 2 instrument. Our intention is to repeat variants of the survey quarterly, main­tain­ing the core battery of state­ments eval­u­at­ing demo­c­ra­t­ic per­for­mance and rotating addi­tion­al questions into the mix to explore his­tor­i­cal and com­par­a­tive cases. For the core battery, we will pri­or­i­tize stability for purposes of com­par­isons over time, but we also aim to establish the best possible instrument. In Wave 1, we asked respon­dents to evaluate all 19 of the state­ments twice — first in a battery asking how important each principle is to democracy in general and then again in battery asking about the per­for­mance of U.S. democracy. With the expanded list of state­ments in Wave 2, we decided to reduce the burden on respon­dents by request­ing an eval­u­a­tion of a randomly selected subset of 15 of the 29 state­ments. This change lightened the load on respon­dents con­sid­er­ably, although it reduced the number of responses we received eval­u­at­ing any given statement (which ranged from 531 to 612). On Wave 2, we included all four state­ments in order to confirm that the proposed replace­ments tap into related ideas as the originals. The responses for each pairing in Wave 2 suggests they do. For instance, the 84% of respon­dents for the original consensus question indicated the U.S. “does not” or only “partly meets” the standard versus 90% for the new common under­stand­ing question (cor­re­la­tion = 0.56 among those who answered both questions). Similarly, 85% of respon­dents said the U.S. “does not” or only “partly meets” the standard for the original majority restraint question versus 89% for the new com­pro­mise question (cor­re­la­tion = 0.43). We therefore plan to drop the two original state­ments in future waves of the survey. This entry was posted in BLW on May 23, 2017 by Bright Line Watch. What makes checks and balances function in some pres­i­den­tial systems, but not others? With President Trump’s 100th day in office fast approach­ing, the con­sti­tu­tion­al crisis that many critics feared has yet to mate­ri­al­ize. Rhetorically, Trump continues to claim vast powers. In practice, when both the courts and Congress have pushed back, the admin­is­tra­tion has demurred. This entry was posted in Monkey Cage on April 25, 2017 by Bright Line Watch. Live from the Chicago Council on Global Affairs. This entry was posted in Events on April 11, 2017 by Bright Line Watch. This entry was posted in Events on April 7, 2017 by Bright Line Watch. BLW conducted its first U.S. Democracy Survey from February 13–19, 2017. We invited 9,820 political science faculty at 511 U.S. insti­tu­tions to par­tic­i­pate and received 1,571 responses (a response rate of 16 percent). The set of invitees was con­struct­ed from the list of U.S. insti­tu­tions rep­re­sent­ed in the online program of the 2016 meeting of the American Political Science Association con­fer­ence. We then collected email addresses for regular, adjunct, and emeritus faculty from the political science depart­ments at each of these institutions. The survey had two broad goals. The first was to learn what qualities our respon­dents regard as most essential to democracy. Democracy is a complex, contested concept whose def­i­n­i­tion has been debated for centuries. 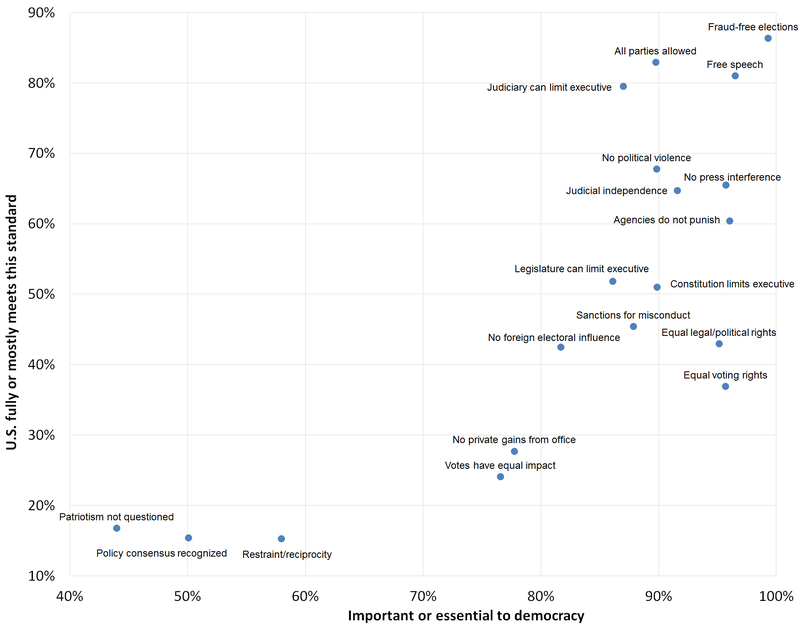 We wanted to know which char­ac­ter­is­tics pro­fes­sion­al political sci­en­tists regard as the most important for democracy and which elements they regard as less essential. Our second purpose was to use that same set of char­ac­ter­is­tics to assess how our respon­dents rate the current state of democracy in the United States. Elections are conducted, ballots counted, and winners deter­mined without pervasive fraud or manipulation. 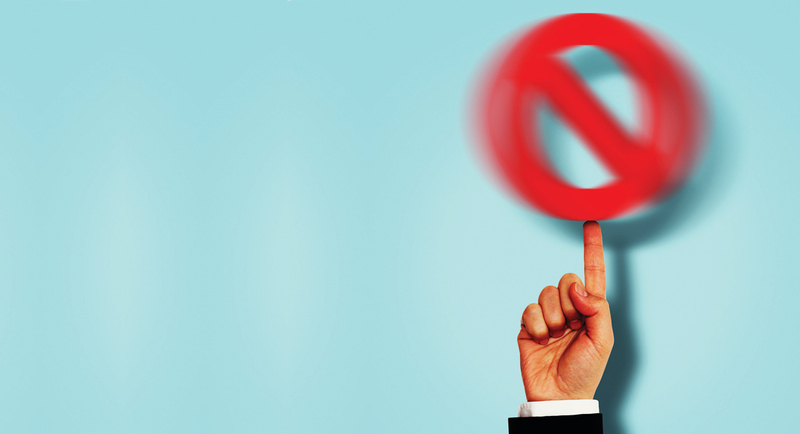 Government protects indi­vid­u­als’ right to engage in unpopular speech or expression. Government agencies are not used to monitor, attack, or punish political opponents. Government does not interfere with jour­nal­ists or news organizations. All citizens have equal oppor­tu­ni­ty to vote. All citizens enjoy the same legal and political rights. The elected branches respect judicial independence. Executive authority cannot be expanded beyond con­sti­tu­tion­al limits. Government effec­tive­ly prevents private actors from engaging in polit­i­cal­ly motivated violence or intimidation. Parties and can­di­dates are not barred due to their political beliefs and ideologies. Government officials are legally sanc­tioned for misconduct. The judiciary is able to effec­tive­ly limit executive power. The leg­is­la­ture is able to effec­tive­ly limit executive power. Elections are free from foreign influence. Government officials do not use public office for private gain. All votes have equal impact on election outcomes. In the elected branches, majori­ties act with restraint and reciprocity. Political com­pe­ti­tion occurs without criticism of opponents’ loyalty or patriotism. Not relevant. This has no impact on democracy. Beneficial. This enhances democracy, but is not required for democracy. Important. If this is absent, democracy is compromised. Essential. A country cannot be con­sid­ered demo­c­ra­t­ic without this. The U.S. does not meet this standard. The U.S. partly meets this standard. The U.S. mostly meets this standard. The U.S. fully meets this standard. The order in which state­ments were presented in each battery was ran­dom­ized for each respon­dent so there should be no priming or ordering effects in how they were assessed. 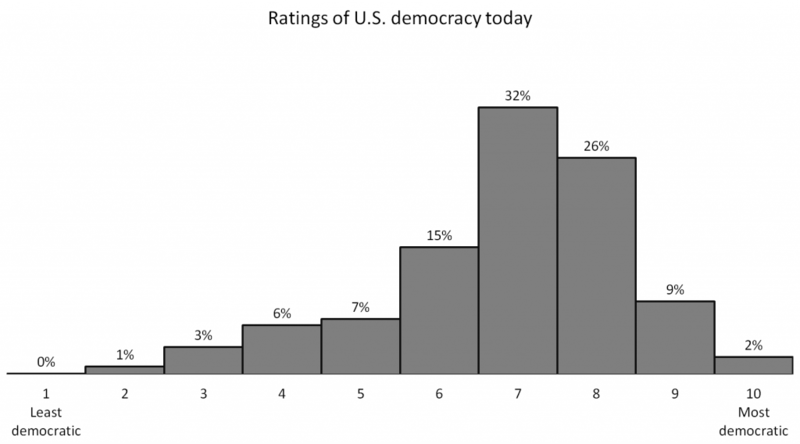 After these two extensive batteries, we asked respon­dents to rate democracy in the United States today on a scale from 1 to 10, where 1 is least demo­c­ra­t­ic and 10 is most democratic. 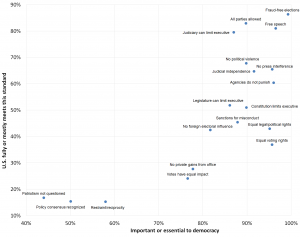 In devel­op­ing this list, we attempted to capture a range of char­ac­ter­is­tics that are prominent in both min­i­mal­ist and expansive def­i­n­i­tions of democracy. The state­ments describe both insti­tu­tions and practices, including elections, citizens’ rights, checks on political authority, mech­a­nisms of account­abil­i­ty, and behav­ioral norms. Of course, our list of attrib­ut­es is not com­pre­hen­sive. However, it includes many — though certainly not all — of the insti­tu­tion­al char­ac­ter­is­tics that foster com­pe­ti­tion and par­tic­i­pa­tion. As such, it arguably speaks more to electoral and liberal con­cep­tions of democracy, such as the insti­tu­tion­al guar­an­tees outlined in Robert Dahl’s seminal work or the Madisonian vision of limited gov­ern­ment, than to more delib­er­a­tive or majori­tar­i­an con­cep­tions. We also tried to select attrib­ut­es that are central to public debate about the status of con­tem­po­rary democracy in the U.S. Again, however, the list is nec­es­sar­i­ly incom­plete. It does not include, for instance, questions about party strength, campaign finance, turnout, or political engagement. Respondents regarded some char­ac­ter­is­tics of elections as far more central to democracy than others. Although political sci­en­tists regularly warn against simply equating elections with democracy, they over­whelm­ing­ly rated elections that are free of wide­spread fraud and manip­u­la­tion as the most important single element of democracy among the nineteen on our list. Fully 92% of respon­dents rate elections without wide­spread fraud as essential, which is far higher than for any other principle, and another 7% regard them as important. 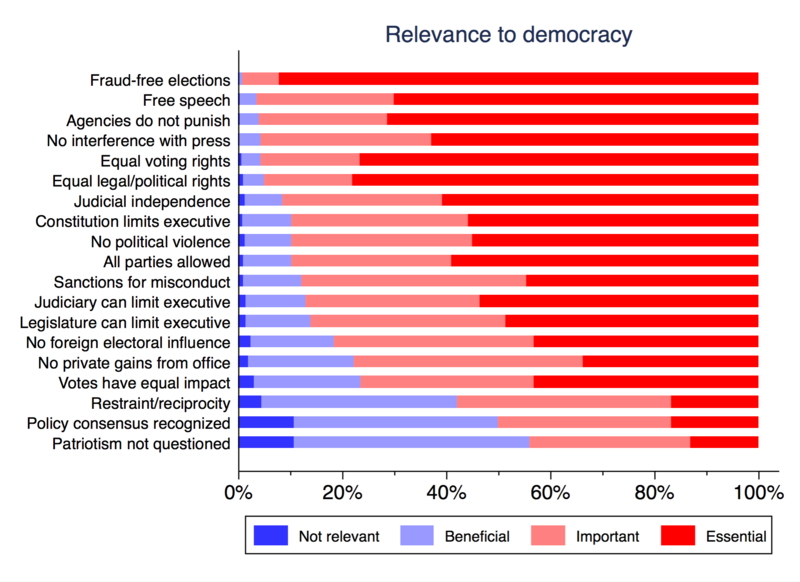 Besides clean elections, respon­dents identify a series of char­ac­ter­is­tics related to basic indi­vid­ual rights as highly important, including free speech (#2), equal access to the vote (#5), and equal political and legal rights for all citizens (#6). Also toward the top of the list is a group of char­ac­ter­is­tics that focus on safe­guards for political oppo­si­tion and dissent: no sur­veil­lance and harass­ment by gov­ern­ment agencies (#3), a free press (#4), gov­ern­ment pro­tec­tion against private political violence (#9), and guar­an­tees for parties to compete regard­less of ideology (#10). A group of items in the middle of the dis­tri­b­u­tion pertain to mech­a­nisms of account­abil­i­ty: judicial inde­pen­dence (#7), restraints on the expansion of executive power (#8), guar­an­tees that mis­con­duct by public officials will be sanc­tioned (#11), the ability of the judiciary (#12) and the leg­is­la­ture (#13) to check executive authority, and that gov­ern­ment officials do not use public office for private gain (#15). Nearer to the bottom are two char­ac­ter­is­tics of elections that have been con­tro­ver­sial of late in the United States — that they should be free from foreign influence (#14) and that all votes should have equal impact on election outcomes (#16). The contrast with respon­dents’ emphasis on elections free of fraud (#1) and equal voting rights (#3) is note­wor­thy. Perhaps reflect­ing the knowledge that there is no neutral way to aggregate pref­er­ences, the responses to our survey display a sharp dis­junc­ture between insis­tence on equality in citizens’ right to vote and the level of impor­tance given to those votes having equal impact. Clustered at the end of the list are some behav­ioral norms that are not codified in statutes or the Constitution, but that have been the subject of dis­cus­sion in the past year — that elected majori­ties should act according to norms of restraint and reci­procity (#17), that politi­cians should campaign without dis­parag­ing their opponent’s patri­o­tism or loyalty (#18), and that public officials should recognize sci­en­tif­ic or bureau­crat­ic consensus (#19). It is important to note that roughly 90% of respon­dents still ranked such norms as at least ben­e­fi­cial to democracy. The picture here is mixed. On only 10 of the 19 attrib­ut­es did half or more of all respon­dents judge the United States to mostly or fully meet the standard in question. At the high end, 86% said the country mostly or fully meets the standard that elections are free from wide­spread fraud and manip­u­la­tion. Likewise, the U.S. performs quite well in terms of open party com­pe­ti­tion, pro­tect­ing free expres­sion and media, judicial inde­pen­dence and checks on executive authority, and pro­tec­tion from private political violence and gov­ern­ment harass­ment. By contrast, respon­dents gave rel­a­tive­ly low marks to the U.S. on the remaining char­ac­ter­is­tics. For example, more than half of the political sci­en­tists surveyed estimated that the U.S. does not meet or only partly meets the standard that elections are free from foreign influence. Similarly, more than two-thirds said that the U.S. did not meet the standard of gov­ern­ment officials refrain­ing from using public office for private gain and votes having equal impact. And more than three-quarters responded neg­a­tive­ly to U.S. per­for­mance on basic norms of debate and deliberation. It is espe­cial­ly inter­est­ing to consider how political sci­en­tists rank the U.S. in terms of the char­ac­ter­is­tics that they regard as espe­cial­ly important to democracy. This rela­tion­ship is captured in the figure below, which plots the combined share of responses that rate the U.S. as fully or mostly meeting each standard against the share of responses that rate a principle as essential and important to democracy. 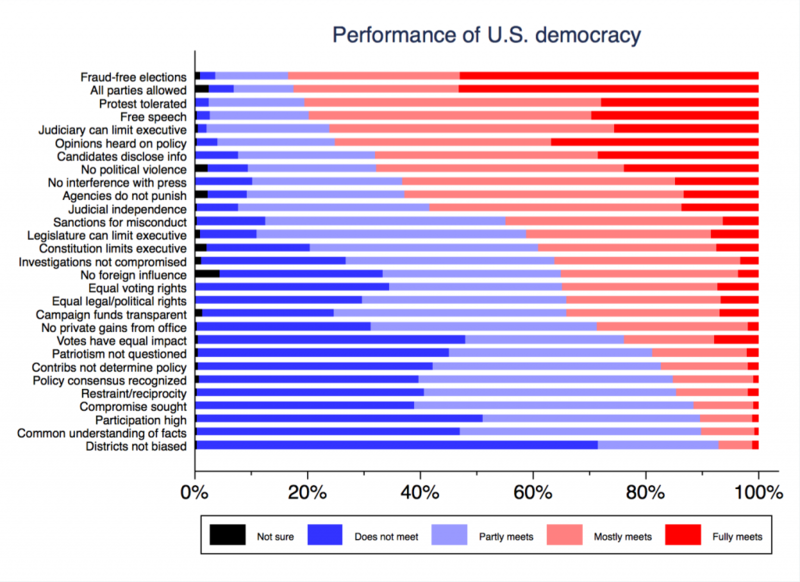 There is a clear positive cor­re­la­tion between assess­ments of impor­tance to democracy and perceived US per­for­mance. Perhaps most reas­sur­ing­ly, respon­dents rate the U.S. highest on the char­ac­ter­is­tic they view as most essential to democracy — clean elections. The contrast with President Trump’s narrative of rampant voter fraud is stark on this count. Using data from the 2016 election and prior contests, scholars have closely examined claims that voter fraud is wide­spread and have con­sis­tent­ly found no evidence to sub­stan­ti­ate them. Political science faculty at large appear to have accepted these findings and accord­ing­ly rate U.S. elections highly. The U.S. also fares well on other important dimen­sions ranging from party com­pe­ti­tion and free speech to the judiciary’s check on the executive and limiting private political violence. There are, nev­er­the­less, multiple important attrib­ut­es on which half or more of respon­dents regarded the U.S. to be falling far short of demo­c­ra­t­ic standards. Most notably, respon­dents rate the U.S. rel­a­tive­ly low on the qualities held to be second- and third-most important for democracy — equal legal and political rights and equal voting rights for all citizens. These eval­u­a­tions likely reflect concerns about racial dis­par­i­ties in the appli­ca­tion of criminal law and the poten­tial­ly disparate effects of voter reg­is­tra­tion and iden­ti­fi­ca­tion laws and changes to voting pro­ce­dures on minority voters. The United States rated even lower on some norms of behavior that, although less critical, are still regarded as either essential or important to democracy by around half of our respon­dents. On the state­ments about civil political discourse, majority restraint, and deference to non-political sources of infor­ma­tion, more than 80% regarded the United States as failing. Some prominent observers (here and here) regard erosion of behav­ioral norms along these lines as an early warning sign of demo­c­ra­t­ic backsliding. 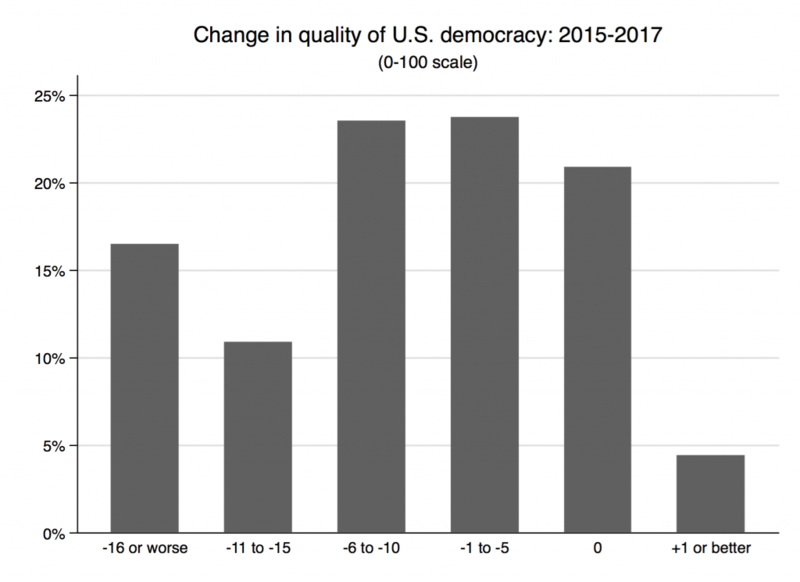 The next figure shows how respon­dents rated democracy in the United States on a 1–10 scale (where 1 is least demo­c­ra­t­ic and 10 is most demo­c­ra­t­ic). The responses skewed toward the favorable end of the rating scale. Almost seven in 10 respon­dents (69%) rated the U.S. at 7 or better and 36% at 8 or better, while only 1 in 6 respon­dents rated it at 5 or below. We are hesitant, for now, to interpret these scores without points of com­par­i­son both across time and cross-nation­al­ly. We hope to provide such com­par­isons in future work. At this point, though, it fair to conclude that expert opinion among political sci­en­tists views the state of democracy in the U.S. rel­a­tive­ly favorably, though they also recognize some serious flaws. These findings provide mixed news. Despite an atmos­phere of pessimism or panic among many observers and public intel­lec­tu­als, the political science community holds a rather nuanced view of demo­c­ra­t­ic gov­er­nance in the United States as of February 2017. They rate the U.S. as per­form­ing well on many of the criteria that they say are most important for democracy. For instance, 86% say the United States fully or mostly meets the standard that elections are free and fair and approx­i­mate­ly 80% say the same for the standards of pro­tect­ing free speech and the judiciary limiting executive power. The results, however, also provide sig­nif­i­cant reason for concern. Fewer than two-thirds (66%) are as confident that jour­nal­ists can operate unimpeded by the state, that the elected branches respect judicial inde­pen­dence (65%), or that gov­ern­ment agencies are not used to monitor and harass political opponents (60%). Only the barest majori­ties are confident that Congress can effec­tive­ly check the executive or that executive authority can be con­strained within con­sti­tu­tion­al limits (52% and 51%, respectively). With regard to equal rights, both in voting and more generally, our respon­dents assess U.S. per­for­mance even more dismally, probably reflect­ing long-standing insti­tu­tions of electoral exclusion and wide socioe­co­nom­ic inequal­i­ties that have been matters of concern for many years. Finally, respon­dents’ eval­u­a­tions of basic behav­ioral norms related to civil discourse, reci­procity, and the recog­ni­tion of common standards of facts and analysis rate worst of all. Ultimately, these findings provide an essential baseline measure of how political science experts view the status of American democracy in early 2017. As part of our continued effort to track what a wide range of pro­fes­sion­al political sci­en­tists think about democracy in con­tem­po­rary America, we welcome input on these surveys going forward. We plan to conduct addi­tion­al waves of the survey each quarter that will include new questions and com­par­isons with other time periods and other parts of the world. We invite critical feedback on our initial design and also encourage col­leagues to use the data from our survey to examine our results further. In all of these ways, we hope to foster informed debate among our pro­fes­sion and in the country at large about the health of American democracy. 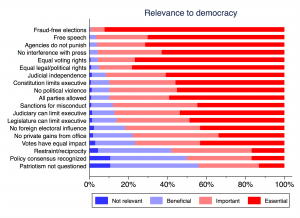 Our goals in designing the BLW U.S. Democracy Survey were to measure which char­ac­ter­is­tics our respon­dents regard as most critical to democracy and to assess the per­for­mance of democracy in the United States and elsewhere against that set of ideals. We first wish to report that our efforts to design a survey that allowed respon­dents to make dis­tinc­tions among different char­ac­ter­is­tics of democracy appears to have been successful. 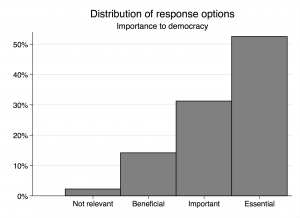 For this survey to provide useful results, it was important that respon­dents did not simply equate democracy with every nor­ma­tive­ly desirable char­ac­ter­is­tic of politics and gov­ern­ment. If they had simply rated each char­ac­ter­is­tic as essential, the survey would have provided no infor­ma­tion about their relative importance. Respondents effec­tive­ly used three of the four response options and those answers skewed toward the highest scale value. However, the dis­tri­b­u­tion of responses varied tremen­dous­ly at the statement level. Consider the first bar graph showing the dis­tri­b­u­tions of responses for each statement about impor­tance to democracy. The combined share of responses indi­cat­ing that a given principle is either important or essential runs from 99% for clean elections to below 50% for respect­ing political opponents. The pro­por­tion of respon­dents rating a char­ac­ter­is­tic as essential varies even further (11% to 92%). We find these results reas­sur­ing. They suggest that respon­dents regarded our state­ments as relevant to democracy, but sharply dis­tin­guished among them in terms of their relative priority. The next figure shows the cor­re­spond­ing dis­tri­b­u­tion of responses on the U.S. democracy battery. Reassuringly, respon­dents used the whole scale in rating the per­for­mance of the U.S. The dis­tri­b­u­tions of responses also varied dra­mat­i­cal­ly across the statements. 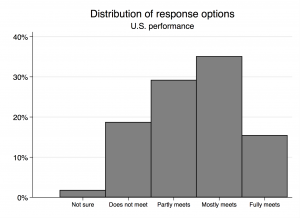 In the second bar graph, showing the dis­tri­b­u­tions of responses for each statement with respect to US per­for­mance, note in par­tic­u­lar the dis­crep­an­cies between the shares of “Fully meets this standard” (red) and “Mostly meets this standard” (pink). We expected many respon­dents to be reluctant to render a judgment of full com­pli­ance with almost any standard. (After all, there are are always devi­a­tions from demo­c­ra­t­ic ideals.) We therefore regarded the combined share of “Fully meets” and “Mostly meets” responses to be par­tic­u­lar­ly infor­ma­tive in showing that respon­dents were dis­crim­i­nat­ing between statements. 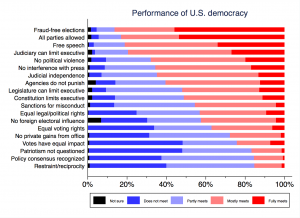 First, our aim with the first survey was to assess how political sci­en­tists define democracy and how they rate its per­for­mance in the United States. In sub­se­quent surveys, we plan to ask respon­dents to assess U.S. democracy in other time periods and to assess democracy in other countries. In other words, we sought to design the survey to be flexible and gen­er­al­iz­able. In crafting the state­ments in our batteries, we sought to reflect prin­ci­ples that are salient cross-nation­al­ly and across time periods. The first survey estab­lish­es some baseline results that will be useful for com­par­isons going forward. It would be disin­gen­u­ous, however, not to acknowl­edge that our own level of interest in these issues was elevated by recent events in the United States. The election that brought Donald Trump to the pres­i­den­cy was unprece­dent­ed in recent history in numerous respects. Many of the actions and behaviors for which Trump is crit­i­cized are reflected in the state­ments included on our survey. Furthermore, political science faculty, like the pro­fes­so­ri­ate more generally, tend to identify with the Democratic Party and a number of political sci­en­tists have published com­men­tary (here, here, and here) arguing that the Trump pres­i­den­cy rep­re­sents a threat to American democracy. Inviting foreign influence over the U.S. election. Respondents did rate the U.S. low on the state­ments most closely related to those con­tro­ver­sies, but they also ranked these char­ac­ter­is­tics among the least important to democracy (#19, #18, #15, and #14, respec­tive­ly). These results suggest that respon­dents were not merely using the survey as a vehicle for anti-Trump venting, which is welcome news. There is certainly more to say about the first BLW survey. We will monitor feedback carefully and invite thought­ful crit­i­cisms of the survey, par­tic­u­lar­ly those that suggest ways to improve going forward. We are open to pub­lish­ing such con­tri­bu­tions on this blog in an effort to generate a sustained dis­cus­sion about how best to evaluate what matters to democracy and how to measure it in practice. For now, we are gratified with our initial survey on a number of counts. First and foremost, we appre­ci­ate that so many of our col­leagues were willing to take the time to offer their views and expertise. Second, the state­ments we included in our batteries appeared to resonate with respon­dents, but also allowed them to dis­tin­guish prin­ci­ples according to impor­tance. We think these results tell us quite a bit about which char­ac­ter­is­tics political sci­en­tists regard as central to democracy and which they regard as more periph­er­al. Finally, our respon­dents appear to have answered these questions in a rel­a­tive­ly dis­pas­sion­ate manner. At the least, they did not appear to engage in reflexive expres­sions of dismay at the new admin­is­tra­tion — an encour­ag­ing sign for the validity of this new research enterprise. This entry was posted in BLW on February 23, 2017 by Bright Line Watch.